Bom Dia fifth graders! That’s good morning in Portuguese. Flat Stanley checking in. 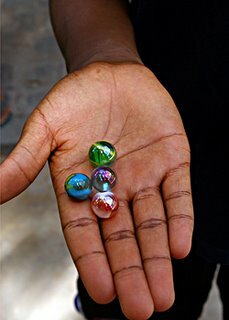 Yesterday was Sunday, and I spent the day with Kaylea checking out ways the boys at the orphanage spend their free time. Guess what? They find ways to fill their time with games, just like you. 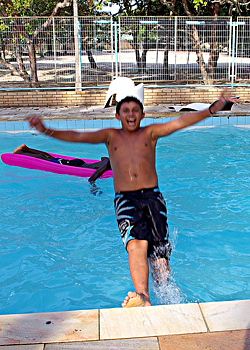 Yesterday the boys spent time playing a ton of stuff, including futebol (soccer), marmore (marbles) and natacao (swimming). They even turned a two-liter Coca-Cola bottle into a punching bag using rope, sand and water. How did you spend your Sunday? Did you play games? Did you read? Taking pictures of the boys playing all those games made me cansado (tired), so I laid down on a bench underneath the coconut trees and took a soneca (nap). Ahhh! Well, this is just a short note. I’ll write more soon! The boys in the orphanage love to play with marbles. 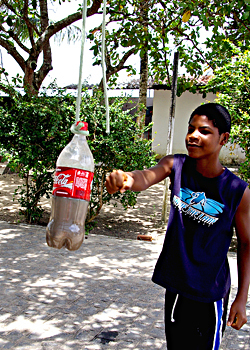 They turned an old Coca-Cola bottle into a punching bag using sand, water and rope. 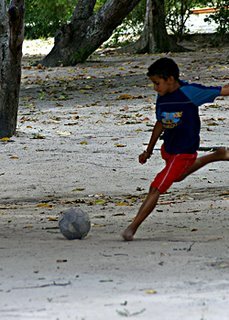 Playing futebol under the coconut trees. 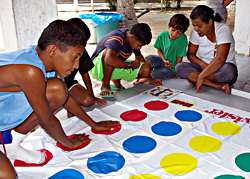 Check out his feet--they play the game without shoes. They must have strong toes! Having fun at the pool.